Dundee Waterfront’s £1 billion regeneration involves 240 hectares of development land stretching 8km alongside the River Tay and is a major 30-year vision to transform the city into a world-leading destination for visitors and businesses. 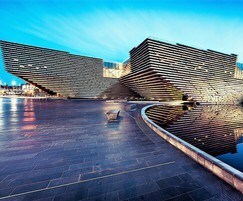 The £80.11 million V&A Dundee museum is the flagship of the redevelopment scheme. The three-storey building was designed by Japanese architecture firm Kengo Kuma, inspired by the rugged cliffs on the east coast of Scotland. The external areas of the museum feature plazas and large-scale water features, with more intimate spaces for people to enjoy. The building is surrounded by natural stone hard landscaping which is prominent in and around the museum’s landscape creating an overall aesthetic for visitors to see and relish. Hardscape supplied a variety of materials to the V&A Museum. Carlow Blue Limestone internal tiling to the main entrance area and indoor steps of the museum and the outdoor terraces. Carlow Blue was also laid in plank format. Four shallow ponds were formed using in excess of 700 unique copings, cladding and tactile pieces to navigate the ever-changing radii which sweep round the base of the buildings. More than 100 honed granite bench component pieces were also supplied. Given the complexity of the ponds and benches, Hardscape 3D-modelled every unit to ensure correct manufacturing. This project highlighted that supplying to this iconic scheme and being involved in the design, drawings and production of the hard landscape materials and features was no simple feat and ultimately relied upon Hardscape’s experience, knowledge and attention to detail to get the job done and delivered on time. 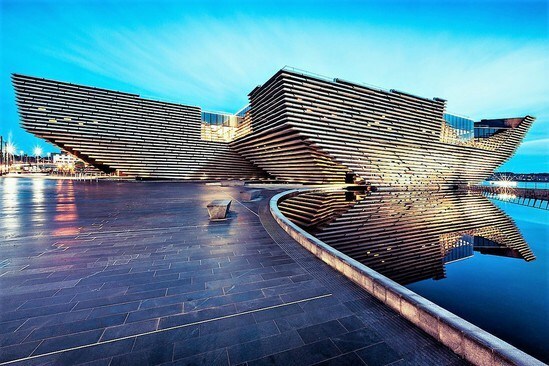 Hardscape’s Scotland Sales Manager, Aidan Baun, says: “The V&A Dundee was a project everyone at Hardscape cared a great deal about being involved in. It was a intricate and complex landscape scheme which we knew we were best placed to deliver on."